Music at Trinity is excited to invite you to the Newport debut of international concert pianist Zsolt Bognar. Hailed by the European press for his "overwhelmingly visceral" playing and a "phenomenal sound world realized through maximum palette," Zsolt Bognár has also been recognized by the Akron-Beacon Journal as "at once extraordinary and authentic." 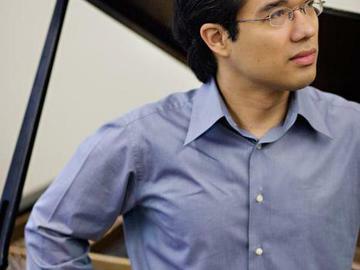 Winner of numerous awards and prizes, Mr. Bognár won first prize in the 2000 Harvard Musical Association Competition, the Boston Musician's Prize, the 2004 Allegro Vivo Competition in Austria and the 2005 CIM Concerto Competition. His appearances abroad have included performances in Hungary, Austria, Germany, Belgium, Japan, Russia, and an ongoing series of tours in the Netherlands that started with concerts from the 2005 and 2006 Holland Music Sessions in Bergen as part of the "New Masters on Tour" series. In the United States, his performances have included appearances at Lincoln Center in New York, the Kennedy Center in Washington, and the venerable 92nd Street Y. In December 2010, Mr. Bognár completed a recording and film project with Grammy-winning producer Philip Nedel in Berlin, and a tour of the Netherlands. A profile documentary about Mr. Bognár prepared by New York filmmakers Pete Hobbs and Elizabeth Foley is forthcoming in 2011. Also from Elyria Pictures in New York is a new series of web videos in regular episodes entitled "Zsolt Bognar & Friends" which seeks to raise awareness about the many issues of musical life, in conversation with prominent musical figures around the world. "Après une lecture du Dante"